It may seem odd to describe stone as “soft,” but that is exactly how the color in a greige or cream stone exterior color schemes feel when contrasted to the color options for darker stones. For the best results, match the softer qualities of the stone to the main colors in the palette you create and keep the strong contrasts for your accents. A stately cream stone exterior topped off with multi-color DaVinci Aberdeen Slate is exquisite. Tonal trim and a vibrant purple on the front door give this home a regal look. For those who love an aged look, a Mossy Cedar roof with Indiana stone are a great combo. Gray with a touch of green and off-white work with both … and a golden door enlivens the scheme. With Coronado Naples stone, beige with a touch of rose is perfect for the main body and trim. Accents of brown give the nod to the Tahoe shake on the roof. Antique Cream with its hints of gray is charming under a Vineyard roof. Let the multi-color roof drive the color scheme. Cool gray and cream trim is accented with wine. Green, gold or eggplant would be equally lovely as the accent color. DaVinci Chesapeake Shake and Glen-Gery Winslow Rustic Stone were made for each other. Join this perfect pair with a tonal scheme of grays and greens. 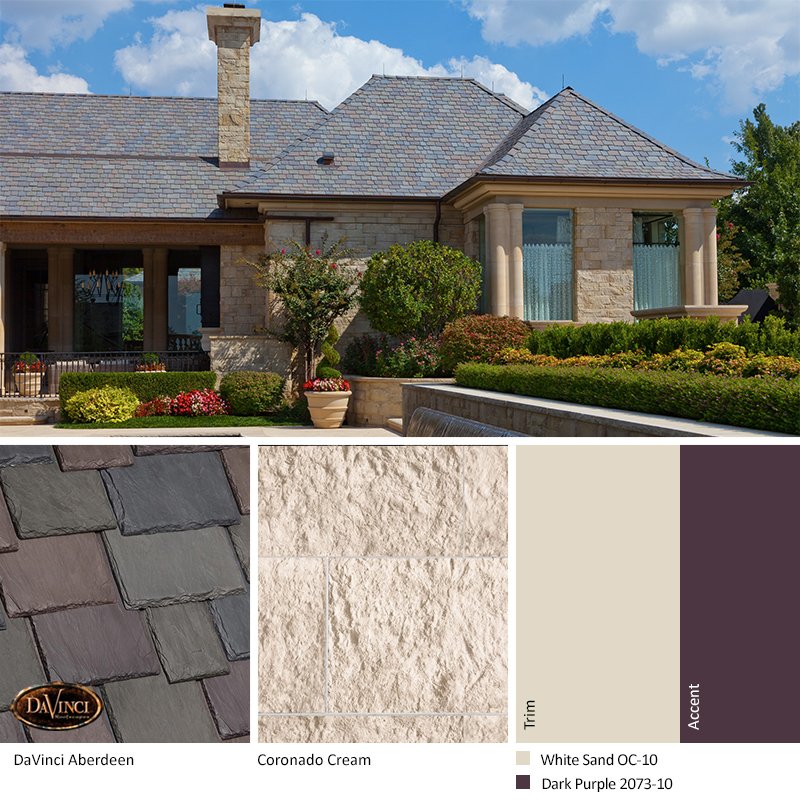 By following the tips above you can find a color palette to complement your white or cream stone exterior. Then for even more helpful information, download our complete guide to select cream stone exterior color schemes – FRESH Home Exterior Color Schemes for Brick and Stone.